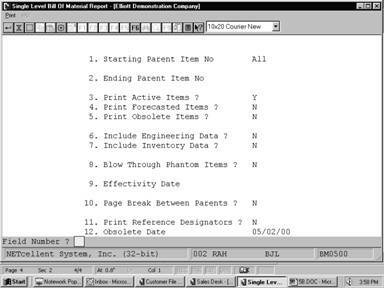 Single Level Bill Of Material prints the single level components for a selected range of parent items. It does not print any components more than one level down. It offers the option of blowing through phantom items (non‑stocked, non‑controlled component items) to show the phantom item's components in place of the phantom item itself. It also allows the operator to choose whether or not he wishes the report to show active items, obsolete items, and/or forecasted items. The application also permits one to choose to include on the report engineering data, inventory data and/or reference designators. Enter the item number of the first parent item for which you wish to print a Single Level Bill of Material report. Enter the item number of the last parent item for which you wish to print a Single Level Bill of Material report. Default is the starting parent item number. Enter Y to print active items or N to decline. Enter Y to print forecasted items or N to decline. Enter Y to print obsolete items or N to decline. Enter Y to include the engineering release or N to decline. Enter Y to include inventory data or N to decline. Inventory data reflects quantity on hand and quantity allocated totals for all locations. Quantity on order is for the default location only. 8. Blow Through Phantom Items? Component items, which are neither stocked nor controlled, are known as phantom items. Answering Y to this question allows you to blow through phantom items to the real component items, which are one level down. Enter the effectivity date you wish to use for printing items. This date will be used to determine whether to include or exclude items. If you press RETURN, no selection will be made based upon effectivity date. You will not be prompted to enter this field unless both active and forecasted have been selected for printing. Default is no selection based on effectivity date. 10. Page Break Between Parents? Enter Y for a page break between parent items or N to decline. Enter Y to print reference designators, or N to decline. Default is N.